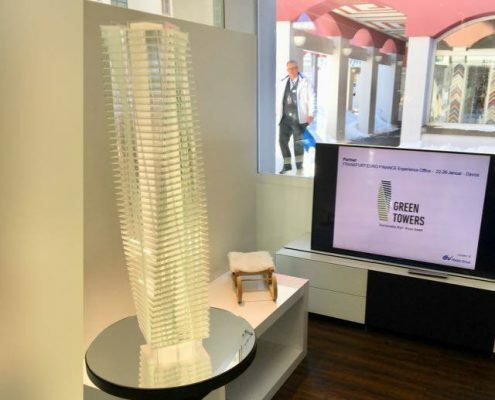 Green Towers was part this years’ meeting of the World Economic Forum in Davos. Bringing together the world’s leaders from almost every part of the world, operating on a global scale, Globalization 4.0 and its influences upon our lives was one of the main topics of the event. Within the Frankfurt Euro Finance Team, Green Towers had great discussions on how to deal and cooperate with the challenges of the future. Green-Tower´ s CEO was invited on a multi-party panel with the esteemed deputy mayor of Frankfurt Uwe Becker to discuss the future of housing and urban development in Frankfurt. Panelists of the Green Party, the Conservatives (CDU) and the Frankfurter Allgemeine Newspaper discussed the fine balance between the urge for speedy change vs. the interests of existing stakeholders in the highly regulated setting of Frankfurt. Even expensive high-rises relieve pressure on housing prices for all because they increase the supply. The Brexit banker, for example, will not crowd out another citizen who looks for space. Cash must not be parked in the sky. Flats in high-rises need to be rented out. There are fonds which specialize in providing investors with tenants. Frankfurt has 280.000 in-coming commuters in relation to 700.000 citizens. Daily commuting time exceeding ¾ of an hour twice starts wearing on health. It would be logical to ask new office developers to build new houses. Office space triggers 3 times more area for tenants. Best practice in other cities shows much shorter approval processes (Vienna) or reduced tax burden for first-time buyers (London / stamp duty) vs. speculative investors. Mr. Kaufmann (The Greens) voiced concerns that new buildings at a planned new suburb could block free fresh air flow into Frankfurt. Mr. Vuksanovic (CDU, conservatives) does not want a Frankfurt in which free spaces will get overcrowded by buildings and parking cars. Mayor Uwe Becker (CDU) stated: “I personally might not opt to live in a high-rise myself, yet I can imagine them to contribute to solving the housing shortage in Frankfurt. 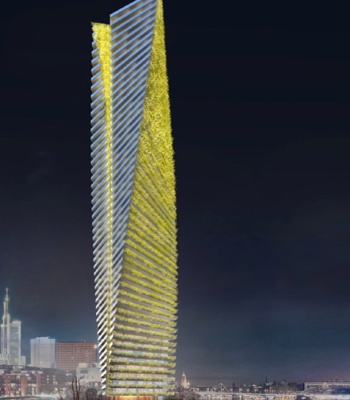 CEO Roland Weber on how to keep high-rises cool. Passivhaus savers 80-90% of the cooling energy also in summer whilst 10% of the global electricity consumption is used for cooling already. Green-Facades on high-rises can cool cities by approximately 2 degrees and vertical gardens reduce stress levels of tenants. Good evening dear viewers! Nice that you are back in a new episode of “on a word”, despite these summery temperatures. This is exactly what our current topic is about! Most people feel discomforted by this hot weather. If you are not already equipped with plenty of fans or an air-conditioner at home, you also think about: How can I cool my flat down, what would be necessary? How do I have to build residential in the future? Therefore, I am very pleased to welcome someone who had a vision regarding this topic. Not only at affordable costs, but also in the framework of Passiv House constructions: it’s Roland Weber, CEO, and founder of Green Towers. Good evening Mr. Weber! Green Towers, that’s easy to guess, is about green towers, green in the sense of planted towers. We will go into that in a moment. First of all, I would like to convey your vision compactly to our viewers. How did the idea arise to work and develop high-rises in combination with greenery? Roland Weber (Founder of Green-Towers): Yes, the green story has frankly said very long roots. It all started in an NGO in the Frankfurt Westend 40 years ago, where we made an effort to give roadside trees more water. A lot of citizens thought about how can we make Frankfurt more livable and greener? It was an important topic. Of course, later life brought me in entirely different areas: More recently in Russia, I built up the technical side of Europe’s biggest high-rise contractor and found out that there is a significant room for improvement in the industry. These high-rises consume energy lavishly, especially, when they are constructed in beautiful glass facdes, which we like aesthetically. We soon understood that the Passive House technology in Darmstadt is a unique opportunity in high-rises to save approx. 80-90% of energy and 50% of the Carbon footprint. If we have a closer look at the future, we can predict that over three billion people flow into the cities within three decades. That means that cities will grow by half of the current population of our planet. Consequently, skyscrapers will become a bigger topic. In this respect, ´Passive House´ is first and foremost a technical matter; it’s about the correct construction, the right shadowing and also well-thought building services. Regarding economic efficiency, there is a payback, an ROI. Passive House in high-rises is as efficient as in single-family houses. Nothing new in principle. As I said, long roots. They also went back to more than ten years ago regarding the need for passive design: I came across it when we planned a city in Libya. Full of enthusiasm I founded the Green Casting Group in Dubai, cooling by plants and through shading with local deset plants was part of the story. Well, as it is with such technology companies, sometimes life goes in another direction. My opportunity to build up Europe’s largest high-rise contractor provided me with a sense of what is overall cost-efficient and what works in high-rise design and construction. The green facades are a rather old topic, rooting in my early years. Using green facades well can offer a lot more potential than what we see in our contemporary systems in the market. Especially in high-rise construction, we have virtually no ecomomic large scale options. There is the pioneer Stefan Böri with his trees on the balcony. Also, there is another pioneer, Patrick Blank, who refined the concept of planted, green walls. However, both are relatively expensive. If we have a look at this heat now, these hot ´tropical nights´ in Frankfurt, in Berlin, where it is 7 degrees warmer at night than in the surrounding; suburban areas, where it does not cool down, and people can’t fall asleep anymore – all this is nothing lofty or abstract. Green facades can cool down cities by two or three degrees. In summer this can change a lot. It can be even more when we think about narrow-standing high-rises or enclosed courtyards. At the same time, this has not only a rational, measuralbe side but also an important psychological influence – as we can see in the next pictures. Rhein-Main TV: Exactly! To make it more tangible and real, you brought some additional images with you. The first one shows Frankfurt’s skyline. On the left-hand side, we can see a Green Tower or rather two Green Towers. Also, the greenery of the Commerzbank tower is revealing, too. Weber: Sure. We should not forget to say that we weren’t the only ones with such thoughts. However, it’s easy to see: This was our competition entry for Frankfurt’s old police headquarters. We were participating as project developers with our twin towers. As a technology company, we become active project developers. Thus, we can control and determine future steps and avoid dilution. You can see that the iconic architecture fits well into the skyline. Our vertical garden, a vertical forest even – located on the north side and planted with ivy, speaks directly to the city. This we’ll see better and more precise on the following pictures. The topic of a vertical garden, a vertical forest shows an entirely different language of high-rise facades and architecture in contrast to the traditional glass and steel structure, located on the left and the right. Rhein-Main TV: Because it was too far away, we can have a more detailed look on this now and see how a garden or in this case a balcony is going to look like from your point of view. On this graph of yours – of course also for you dear viewers – it is clearer. It perhaps seems like there are only simple balcony boxes – however, in the background next to these people is planted in the same height. Would one have to imagine it like this: The whole house is continuously from top to bottom then provided with green? Weber: Exactly! It’s not about to plant some primroses. Important are aesthetical reasons, as well as technical aspects to cool down parts of the city. We are mainly working with climbing plants which are innovative in high-rises. Of course, what does innovation mean? The old Romans already had climbing plants, surely ivy on their mansions. Yet, in our opinion, this is the ideal solution for high-rises: climbers are robust, easy to handle, don’t cost too much and in contrast to the other established systems on the market they have a low-maintenance. This is our backbone. As seen in the pictures, the vertical garden speaks in two ways: to the city, and also to the tenants. It’s not only about measuring something – like the two degrees – it’s also about the psychological part. This is quite strong. Just a simple example: When I am sitting in a street café, and there is some greenery surrounding me, traffic and other noises around me seem quieter to me. That is mostly a psychological effect. You feel less disturbed. Also, there are among noise many other factors, playing in. Including dust filtration, pollution, emissions and also stormwater retention. Yet, let´s not get too technical. The most important things are lifestyle and wellbeing: that is the main thing for us. Rhein-Main TV: What effects greenery and plants have on not only a lifestyle but also emissions, will be topic in a moment. Here we show a picture of an ivy façade. Weber: Yes, this ivy façade here really is a very plain, simple and scrubby one. In this street in the Frankfurt Westend we already have a hanging façade for years. It worked perfectly well during hot summers and cold winters. And It shows nicely that its roots cope well above ground. Thereby let´s assume without expensive gardeners taking much care about it. Rhein-Main TV: So, this is also a barrier, which has this psychological effect, right? Weber: Yes. I mean, at that moment we had midday heat, at the peak of our recent heat wave. Normally, one wouldn´t like to stay on the balcony or near the window for long. However, with its shade, it already made it all more livable. Rhein-Main TV: I often used this terminology now: Passiv House. For all of you, who aren’t so deeply into it: What is unique about it and for instance when it comes to cooling capacity: What did you improve there regarding high-rises? Weber: Fortunately, we did not have to reinvent the bicycle. We can benefit what the Passivhaus Institute has created. Our vision is about the necessity to do it. I recognised this for myself far before that: I mentioned my passive architecture in Lybia and Dubai from over a decade ago. However, Passiv Houe brought it to perfection. It’s about efficient construction, about isolation, it also is much about the cladding. The beauty about Passiv House is: everyone is talking about making the world green – now I am speaking as an engineer – but in the end, you always ask yourself: What is the real impact, the added-value at which cost? The good thing about Passiv House – It makes this 100% transparent. Rhein-Main TV: What does this exactly mean? Transparency regarding figures and how to save energy in the end? Weber: We exactly know every figure and information, in contrast to the best global standards, on how we can save 80%-90% of energy. Additionally, we have a Return on Investment. Also, they are perfect in their scientific research: Without it, I could have never explained my vision. It is an own scientific world – I guess there are about 50-60 engineers and PhD- physicists who are constantly refining their formulaes. Rhein-Main TV: Cooling is a central topic, which interested a lot of people at the moment. Passive House standard stands for a well-balanced temperature, independently of the season. With vertical greenery, the cooling effect is even more significant. Weber: Yes, first of all: Passive House makes every action easily measurable: when I have a certain amount of energy consumption, a certain amount of CO2 will be produced. This chain is transparent. We also work parallel to Passive House: The green façade is not necessary for the Passiv House technology. Passiv House is, first and foremost a technical storyline. When there is a heat wave, you close the windows; they are well-isolated and well-shadowed: It is just a very technical side of things, which is working very well and doesn’t need a lot of cooling. This works not only in winter but also in the summertime. We believe that green facade something that cities should do more. Singapore is a thought leader, for instance when it comes to building regulations: They have financial incentives for project developers. When planning with green facades, they get benefits. This is undoubtedly a factor that makes things easier. A good example on how to responsibly and effectively incentivise the finance industry. Rhein-Main TV: That´s correct, but we are still far away from these legislative proposals. In addition to this, there is another psychological effect. I can imagine, if you are presenting these things on a conference, some people might say: Well, a garden in 200m height: How should we do this, who should take care of it? That must be a lot of effort! How does this concept work? Weber: That is precisely the key question when things get serious. At the first glimpse, everybody loves green, but when reallity kicks in: How does it work? There are plenty of good experiences. We got a lot of valuable inspiration from the whole research in Berlin and its green networks. Also, our architects, based in Chicago had a big influence. Chicago is well-experienced with extreme climate. 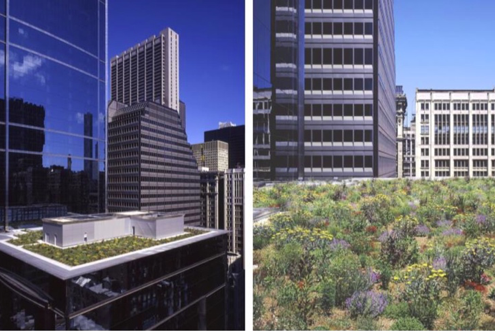 They have many stormy roof gardens on their high-rises: They are located in wind tunnel gorges, which is the worst condition for plants. In Berlin they researched very thoroughly green facades – also other cities do a lot (I mentioned Singapore). Our experience is strongly influenced by the American system, which scientifically categorises plants. Frankfurt has a climate, which is relatively mild. We then choose plants, which are stronger than basic theoretical requirements, just to be safe. Concerning maintenance: there will be drip irrigation, which doesn’t carry significant costs. Climbing plants require low maintenance. They perhaps need to be taken care of annually. A bit more when you want the facade to bloom, and the whole tower to change colour: This can happen in fall and in spring. Rhein-Main TV: There is no problem to change a towers colour? That’s how we see our tower. The yellow Forsythia only needs pruning once a year. Blue in summer will be Wisteria, also on the south side. This we will have to prune twice a year. The other ones –wild wine and ivy- are easy to handle. The green facades, we have in Westend – like my parents planted them on their houses after the war too – all grew largely being left alone. Understandably, sometimes a neighbour asked to keep it away from their house, which of course we then did. Either allow it or keep it off. However, apart from this, it all worked by itself where it was planned. So again: What cools our city down effectively? What works? Street-trees do work easily and, in our view, climbing plants on high rises will do this job equally well. They have extremely low maintenance and only need little watering. A bit of effort is necessary, but it is not a significant expense. Rhein-Main TV: So how is it, when we stick to the costs, it is a concept, what you’ve been trying to make that is affordable for everyone. How is that combinable? When we have a closer look at the picture from before: Wonderfully laid out, the tower is twisting a bit with some plants too, which individually don’t make a big difference. But something like this in Frankfurt’s city centre: How should this be affordable? Weber: Overall affordability, in general, is not an easy topic: there are many things, coming into play. First of all, a twisting architecture, an iconic architecture, even with us is a bit more expensive, then a cheap box. Yet through my Russian experience with all these big sites, we developed methods, which also makes iconic architecture ´affordable´, without the usual high extra cost for iconic buildings. And as said: building green doesn’t require too many additional costs, for example, ABG or other housing companies, like us, speak about 3-4% more investment cost for Passiv Haus. We quickly get these costs back by saving energy over a couple of years. Our green facades, in addition, require relatively little effort. I mean, when I own a front yard I also do not let it run wild or expect absolutely zero maintenance. One of us cares more, the other one cares less, but some basic gardening once or twice a year is mot much. And as said, watering is working automatically. Rhein-Main TV: So, despite Passiv House elements: shadowing, isolation and orientation regarding the whole building complex, as well as surrounding greenery, which needs a bit of care and maintenance – it still provides an appropriate price? Would you summarise it that way? Weber: Yes. Physics doesn’t change immediately when you are in 100 meters in height. Admittedly, it is a little bit different. However, Passiv house has shown – that is the beauty of it – we can use this quality label and knowledge, which we are very thankful of. By the way, as we know Passiv House well doesn’t lead to rising costs with Single- or Double-family houses, which can’t be compensated over a couple of years – it also doesn’t differentiate concerning high-rises. Green-Towers just developed one construction solution to implement it. As a technology firm this is the kind of innovation, I was talking about. Also, on the garden side, which uses mass production and a high standardisation, costs are very well controlled. Like with your front yard which is not completely cost-free – you have to make up your mind about whether you want one or not. Rhein-Main TV: To bring it to a close: Are there various projects, which are running globally or are in progress? When it comes to Frankfurt and seeing this wonderful skyline: What is your vision for this city, for which you have been active for a long time and also participated in certain projects? How green can or should Frankfurt be and what do you have to contribute to this development? Weber: Frankfurt is the ´capital of Passiv House´ and is also sometimes nick named a ´jungle´. I think the acceptance for projects like this is high and even curiosity and ambition in society is there. In my opinion, we should demand vertical gardens and green high-rises much more often. We do offer something that surely will be copied; and I say: Why not? There are also other experimental approaches like ´the Eden´ in the Europa-Quarter. Others think about it, too. More of it! No, symbol politics, which lands in some stories or academic reviews, but rather ask how can we move the city at large as well as positively affect tenants. How can we achieve a sustainable high-rise development in the Real Estate Industry? Green Tower’s CEO Roland Weber gave interview for Rhein Main TV, explaining how a sustainable development in Real Estate tall buildings could be achieved. In the next 30 year 3 billion people are expected to relocate to big cities and that will cause another raise in cities temperature. Whilst cities will increasingly go high, skyscrapers with their nice glass facades consume plenty of heating and cooling energy. Green Towers have created the first tall Passivhaus skyscraper which master the challenges of glass facade. This saves 80% of energy and 50% of its lifetime carbon footprint. A simple but clever solution is adding a green façade to the design of the building by using climbing plants. They require a low maintenance, provide shade in the hottest days and have the power to effectively cool the temperature of city heat islands. Green Towers stands for bringing a high living quality to people, by been environmental sustainable and providing homes. Mid-range prices can be achieved if land-plot speculation would be avoided. HOW DO SUSTAINABLE HIGH-RISES FIT INTO URBANIZATION? S.C.: Welcome to business live tv, the magazine that inspires your success and satisfaction, in your professional and private lives. Today with me in the studio is Roland Weber from Frankfurt. Welcome Mr Weber. 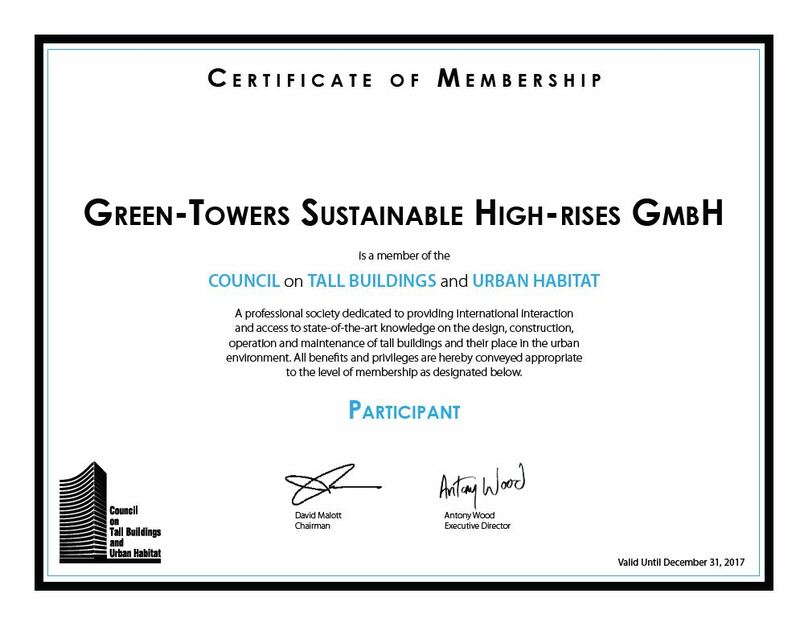 You are the CEO of Green Towers, which is involved in building high-rises in the form of ´Passive House´. R.W. : We are a technology company and, as you rightly said, we have basically created the first fully glazed high-rise that functions as Passive House. That means we save around 80% of the energy as well as 50% of the total carbon footprint. In the next three decades, around three billion people will relocate to cities. Cities will continue to grow. The question is, how can we shape such a transformation? 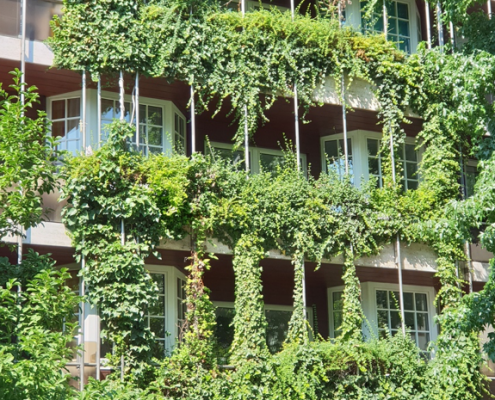 Cities are constantly growing and getting warmer, and our way of tackling this is with a high-rise that has a garden-facade, which is robust, simple and cheap enough that it can be implemented on a grand scale. We work with climbing plants and these cool the temperature of heat islands within the city. S.C.: Mr Weber, you have also traveled a lot. 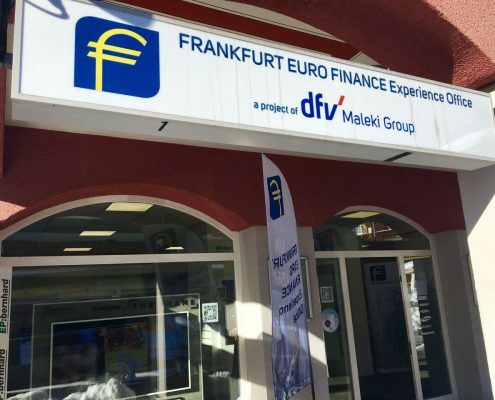 You are a Frankfurt man at heart, and you have been to many other countries around the world. Is that what inspired you in this respect? R.W. : Yes, I had the chance to spend a number of years in Russia, technically leading and building up Europe´s biggest high-rise contractor. actually work and live in these kind of high-rises. You should always endorse what you yourself believe in. There have been many occasions where we have said ´this was good´ and ‘these are the cherries we want to pick out’. On the other hand we have also found out deficits especially in green tall building. Consequently we are working to significantly improve them. S.C.: Now, let us explain again how it works with the plants. Well are enough plants on such a high-rise? It is not only a few plants in relation to the unbelievable size of this building? And how can they actually influence the climate of the premises? R.W. : Yes, they influence the climate in the building and of the city. Of course we can’t, let’s say, just plant some primroses in the window or on the balcony. But rather, like you can also see on the walls of many buildings in Frankfurt, use climbers. Climbers there are like huge trees. They have enough horse power to cool and to provide shade. As part of urbanization, cooling and shade is very important for growing core cities. What we are doing on the facades also has to remain affordable and feasible in terms of maintenance. S.C.: If in doubt, would we not have to think a bit beyond the building itself, and take urban planning into consideration? Yes, nowadays 50% of the people live in cities and by the year 2050, they say that two out of every three people will live in cities. We have to plan for that, and say that we have to build in a specific way, but at the same time of course, we have to think about the environment into which we are placing the buildings. So how will we build our cities? R.W. : Town planning, architecture and technical solutions, are deeply intertwined. It is important to make the vision of tall green facades marketable. It is about doing that in a practical sense and actually supplying reliable technical construction solutions which will function. S.C.: These are interesting starting points. How long does this kind of high-rise remain in the cities? It is still all relatively modern? The construction of high-rises in Frankfurt began just in the 70s. R.W. : That’s right. Being an old native of Frankfurt, I can still remember that. There was a lot of debate and tension around the constructions of the 70s. Then came the next wave in the 90s, where they did a lot of things much better. I think the architects had learned a great deal. These tall high-rises are certainly interesting, since they will not just stand for a few decades, but for many centuries. We have four and a half thousand high-rises around the world over 150 meters tall. Only one has been torn down so far. For us, that means it is very importante for the architecture to be very good and, put simply, something that the people will like. Yes, it is not just designed to adorn glossy brochures and leaflets, but it is for those who live there and those who are affected. Also the vertical garden. People should find it immediately attractive and that has been all-important to our team, including our architects. S.C.: And how do you imagine what it would be like to live in one of your buildings? R.W. : Well of course we practice what we preach. I myself had the opportunity to live in a high-rise in Russia on two occasions. If you ask the people, in London for exemple where a lot more experience has been collected, people love the view. Here we go one step further. We not only see this vertical garden speaking to the city and its inhabitants, but also to the people who live in the building, those who enjoy the view through the glass. And shading plays back into the Passive House design again. We want to create an open living space. That is about how the people are living. It is about light and air, about sun and about the view. Once again, we are also speaking about the same façade facing outwards too. 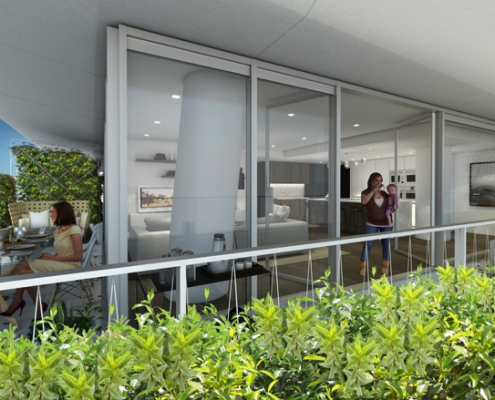 Another very technical aspect of the high-rise is that it is accessible for people with disabilities. Residents with a wheelchair or rollator can go out and get their daily groceries unimpeded by barriers. The Green Tower has many practical aspects on the inside. One more is security. The term ‘gated community’ sometimes comes up a lot, but actually that misses the point. Approximately 400-500 families live in a high-rise, which means it is very affordable to have someone placed on the ground floor. He can be paid by all residentes together. You can talk to him. He always in person keeps an eye on things, and not only the lens of a video camera. S.C.: If I have understood correctly, you have also planned for relatively large outdoor areas, such as balconies or terraces? R.W. : Yes, it will be like living in a penthouse, which also has its own garden. Essentially, it has the feel of a penthouse on every floor. in the shade and protected from the heat. This is where the passive house comes in, it is always about the connection between life and technology. Both are closely related. S.C.: Is sounds like a really special way to live. Another slice of truly luxurious living. Is that right? What are the economic factors of Green Towers? R.W. : Yes, first of all, it would be nice if, in an ideal world everybody could live in such a nice environment. However we cannot offer the lowest price in this quality market bracket. Trying this would be bit like how it went wrong in the 70s. There will certainly be a lot of people looking at the building, which means it also has to be pretty. Whilst is cannot be the cheapest in terms of costs, we are certainly in the position to project ourselves on a medium price range. Thanks to the experience of my team in Russia, we have essentially managed to make these high-rises significantly more economical. does not cost 10,000 Euros per m2, but 5,000. This is already expensive enough, and we are aware of it, nevertheless it would definitely be interesting. The most difficult component is the social component. It would be great if we could also incorporate these social components, so that we are not always simply seeking how to fuel land speculation, how to make land more expensive. This again pushes investors into another hefty financing risk markup. Not because they are evil, but because they need it. That is certainly a more interesting starting point in the discussion about politics. Namely, whether it is possible to establish such an outstanding product at a médium to medium-high price range. S.C.: That means the product had really been thought out in a versatile manner and, in terms of architecture, with a view to the CO2 emissions, with a view to living, in terms of pricing and also how it is possible to shape the life inside. R.W. : And that is why it is interesting to simply make living in a high-rise attractive. In fact, on the one hand it is the green side mainly of the hull of the building. On the other hand we also need a carrot for the investors. We make both ends meet. “Finance makes it happen“. This side also wants to work, and that is certainly possible with Green Towers. Good high-rises tend to be more expensive; that is the „nature of the beast”. Yet they also can provide a higher quality of life. Therefore it is possible to have a good quality of life in a somewhat smaller apartment. I discovered that myself in Russia. There, I had a number of different apartments to choose from. Some of them were big and dark, or alternatively in a high-rise with a great glass facade and a view of the park and the river. That was much more fun for me. S.C.: I can see that your heart is really in this project and I’m keeping my fingers crossed for you. 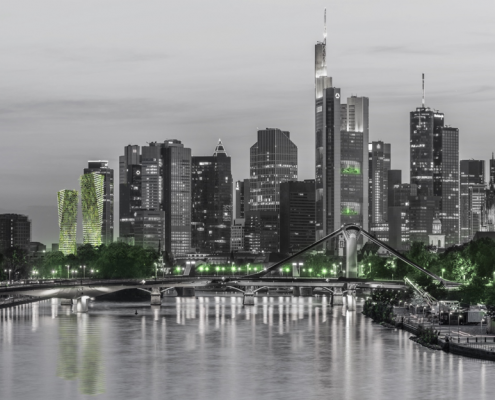 I really hope we will see Green Towers all over the world very soon, and perhaps we can start in Frankfurt. Thank you, viewers at home, we have come to the end. I wish you all the best and look forward to seeing you again next time, on business live tv. Green towers will be at MIPIM from 13th-16th March. 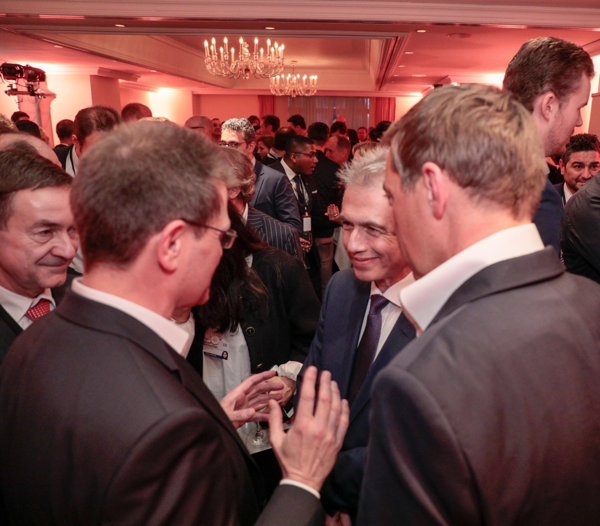 The international property event hosted in Cannes, France each March includes an exhibition area, conferences and events for a period of 4 days gathering together real estate professionals and promoting exchange in business projects between members. This year more than 24.000 participants from 100 countries are expected to take part at the event. Looking forward to meeting everyone from the global real estate industry. Roland Weber in front of the camera of Rhein-Main Aktuell, sharing experience and gratitude of the Green-Towers team to be part of the World Economic Forum. Watch below video fragment of Rhein-Main Aktuell from 30.01.2018. 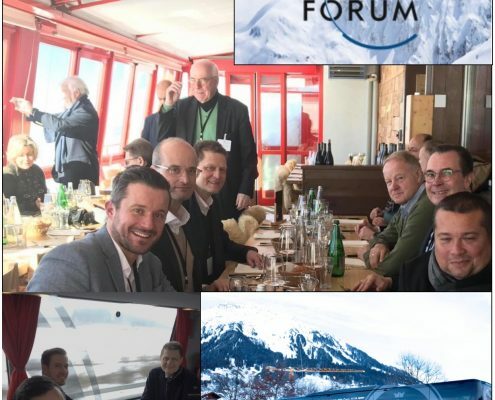 Green towers GmbH was at the World Economic Forum in Davos from the 23rd to 26th of January 2018, where our CEO Roland Weber met with the respected Frankfurt Mayor Peter Feldmann and discussed how to make tall structures green and sustainable for Frankfurt. Sustainability is here to stay and is the future. Best way to predict a sustainable future is to create it. 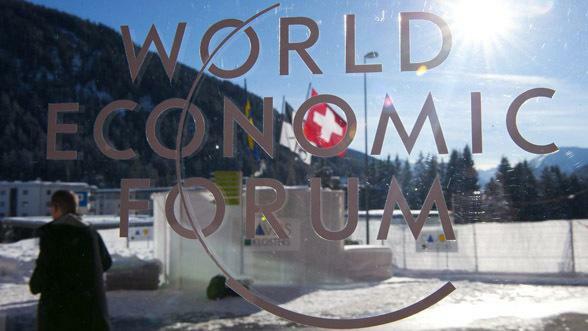 Green-Towers participated at the WEF at Davos in the ´Frankfurt Euro Finance Experience Office´. We showcased our model of an iconic and sustainable high-rise. Green-Towers regularly visits the Real Estate Congress of Oxford Said Business School and venues of the Oxford Real Estate Society. GREEN-TOWERS at the MIPIM 2017. 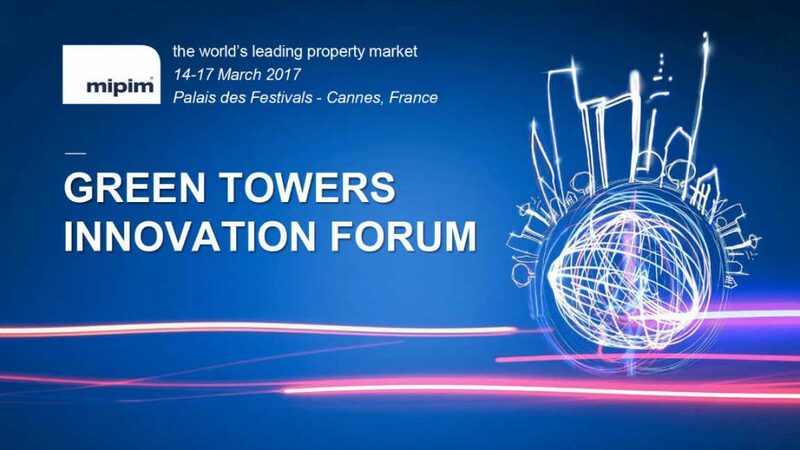 GREEN-TOWERS exhibiting at the MIPIM 2017 innovation forum. Project architect Todd Halamka (Chicago) and CEO Roland Weber. Sämtliche Texte, Bilder und andere auf der Internetseite veröffentlichten Werke unterliegen – sofern nicht anders gekennzeichnet – dem Copyright der Green – Towers Sustainable High-Rises GmbH, Frankfurt. Jede Vervielfältigung, Verbreitung, Speicherung, Übermittlung, Sendung und Wieder- bzw. Weitergabe der Inhalte ist ohne schriftliche Genehmigung der Green – Towers Sustainable High-Rises GmbH ausdrücklich untersagt. Sofern auf Verweisziele (‘Links’) direkt oder indirekt verwiesen wird, die außerhalb des Verantwortungsbereiches der Autoren liegen, haften diese nur dann, wenn sie von den Inhalten Kenntnis hatten und es ihnen technisch möglich und zumutbar wäre, die Nutzung im Falle rechtswidriger Inhalte zu verhindern. Für darüber hinausgehende Inhalte und insbesondere für Schäden, die aus der Nutzung oder Nichtnutzung solcherart dargebotener Informationen entstehen, haftet allein der Anbieter dieser Seiten, nicht derjenige, der über Links auf die jeweilige Veröffentlichung lediglich verweist. Diese Einschränkung gilt gleichermaßen auch für Fremdeinträge in von den Autoren eingerichteten Gästebüchern, Diskussionsforen und Mailinglisten. All die oben genannten Richtlinien gelten ebenso für jegliche andere Internet-Präsenzen der Green-Towers GmbH.